Review: From the opening measures, Masakatsu Takagi’s soundtrack for Bakemono no ko (The Boy and the Beast) is no rehash of his sublime score for Wolf Children. His compositions feel just a bit clumsier, maybe even a bit unrefined and feral, but his penchant for warm, moving melodies remains. These differences are to be expected. After all, moms and dads are both unlike in sensibilities and those differences play out wonderfully in Bakemono no Ko’s soundtrack. “The Beast Festivities” discards any indication of gentleness by injecting rambunctiousness through a bouncing melody. The giddy tempo then rides in to pull you harder and faster into the cacophonous chaos. As you barrel your way through the piece, it’s naturally to feel your pulse quicken as you find yourself ready to embark upon an exciting journey with a bit of trepidation, accompanied by a well-meaning beast-man bearing a confident smirk. And with that, our story begins. The next few tracks lay out the backstory which starts with a chaotic aura manifested through a dissonant electronica crescendo in “Attractive Force”. The overarching emotions it conveys are uncertainty coupled with hints of tragedy and “Stray Boy” picks up on these sentiments, with its warbling, howling ambience before shifting into an ominous ostinato that signals the start of an adventure, with all the adrenaline-pumping panic and exuberance that ensues. Starting with “Horizon”, Takagi’s style from Wolf Children emerges through a mellow piano tone that, while stilted and clumsy, charmingly captures the blossoming friendship between the human boy Ren and the brutish beast-man, Kumatetsu. The tracks that follow yield some lovely vignettes. For example, the woodwinds in “Cosmos In a Child” deliver a sense of mischief as the two begin to grow accustomed to each other. “Pupil” furthers that theme with a heartwarming, uplifting guitar melody. And “Days We All Have” trots along delightfully, channeling a sublime piano melody that winds its way about to leave you glowing in contentment. The theme is reprised immediately after in “A Child Full of Life”. Here, the orchestral arrangement is an utter joy to listen to, especially when the cello’s warm timbre settles in. Of all the themes/motifs that Takagi employs, this one is my favorite by far. Interrupting those vignettes is an excellent set piece, “The Beast Sinfonia” which depicts one of the grandest scenes early on in the film. Here, Kumatetsu and his rival, the nobler Iozan square off in a wrestling match that quickly grows heated and intense. Takagi’s composition echoes the action, taking the motif from the opening track and sculpting the rhythm to capture the battle’s ebbs and flows, including a section where the orchestra grinds its way deliberately to illustrate Kumatetsu’s struggle to prevail before giving up completely with a whimper as the melody trails off. The joyful moments continue their course, but once Bakemono no Ko treads into darker waters, so too does the soundtrack. A discernible shift occurs in the foreboding “Lotus in Mud” where dissonant chimes and a cacophonous blare herald the coming calamity. The orchestra then seizes upon the imminent tension by pouncing in with intense action music that whizzes about at a dizzying pace in “Portrait of Solitude”. There’s a respite in the next few tracks, but again, the eerie dissonance returns, coming to a head in “Trace of Hollow Dreams” where disembodied voices abound and the strings pronounce an aura of dread that begins the descent into tragedy. But hope still remains and “A Sword in Your Soul” is where it materializes. For after the harried battle tracks enter the fray, there’s a moment of tranquility borne by the piano and strings to lift your spirits. Takagi’s melody is enough to restore the inner strength needed to finish the battle out atop the grandiose brass fanfares and close the soundtrack once and for all with an uplifting piece that’s hearkens towards a better tomorrow. 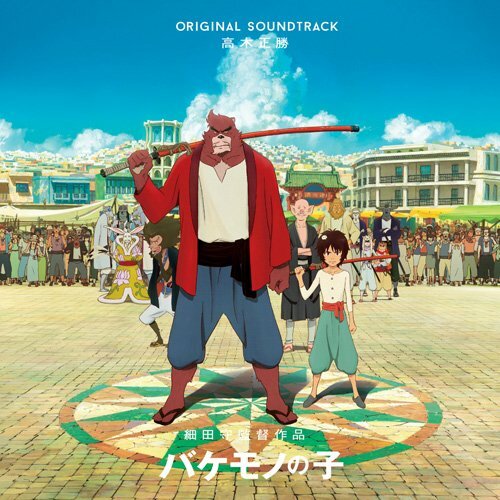 While I didn’t feel as tight an emotional connection with Masakatsu Takagi’s score for Bakemono no Ko as I did with Wolf Children, there’s no denying his deft grasp in setting Mamoru Hosoda’s narrative to music. From the blaring brass’s energy, to the occasional stilting orchestral melodies, to the piano’s blossoming warmth, Takagi’s music is exquisite, its delivery poignant, rawness and all, in tying together a beautiful father-son dynamic.